TechChange and UNICEF are proud to announce the release of 2 landmark eLearning courses: one on the intersection between frontier technology, venture capital, and the work of UNICEF, designed for UN staff and country office personnel, and the other on leveraging open source business models in technology for good, designed for emerging startups in the frontier technology field. The courses are set for their pilot run in January 2019. In UNICEF’s Frontier Technology course, course participants will explore the intersection of business, technology, and social good to prototype open source, scalable innovations that address the most pressing challenges in the lives of vulnerable children. Through a comprehensive review of our global challenges and issues, the opportunities that exist in data and technology, and the most exciting scalable solutions, the course will support Country Offices and staff in connecting with partners, preparing prototypes and pitching their ideas to stakeholders and funders. In UNICEF’s Open Source Business Models course, course participants will learn about open source as a business model, including how open source can solve common problems that businesses typically face, why open source can actually generate revenue more sustainably than a proprietary business can, and how to build an open source business — culminating in an interactive version of the Business Model Canvas with sticky notes for general information, information with an open source focus, a case study, and a method for filling in their own canvas (as depicted in the GIF below). The course aims to educate startup founders in developing and emerging economies about the merits of open source, dispelling common myths and misconceptions, and assisting participants in improving their own business model along the way. The project team at UNICEF’s Office of Innovation, led by Sunita Grote (Innovation Fund Manager) and Milja Laakso (Innovation Fund Portfolio Collaborations Consultant), worked closely with TechChange’s instructional designers to create this engaging, comprehensive course series that utilized engaging interactions, filmed interviews, targeted knowledge exercises, and curated resources in each section of the courses. Throughout course development, which spanned nearly a year (January through November 2018), TechChange designers consulted more than 40 subject matter experts from the UN and UNICEF and from the private sector, both in recorded interviews, for the benefit of learners, and off the record as background research. 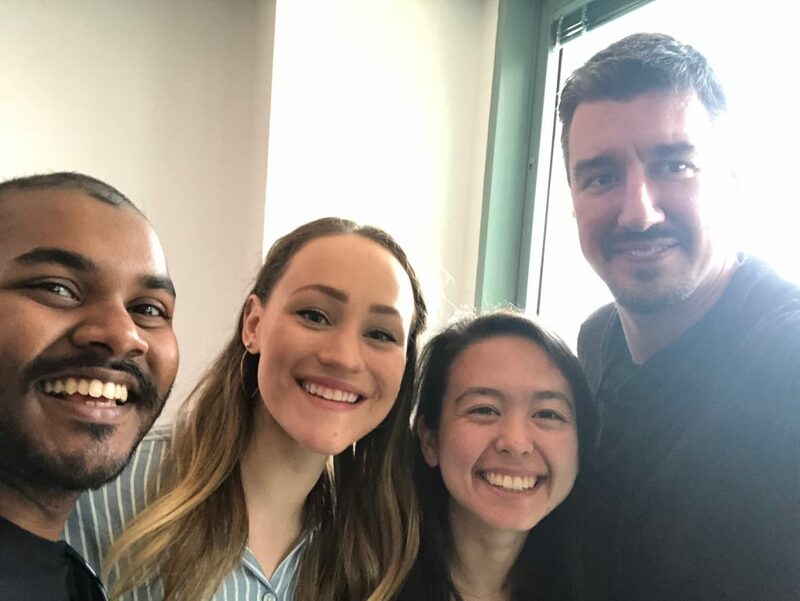 Creative Director Yohan Perera joined the instructional design team in May at UNICEF Headquarters in New York City for filmed interviews with UNICEF Innovation Co-Founder Chris Fabian and other members of the Innovation team. TechChange opted for a streamlined course interface design, implementing a static menu at the top of course slides and recurrent course navigation buttons at the bottom of course slides. The team designed inventively when it came to displaying user progress, piloting the course map for the Frontier Technology course and the planner feature for the Open Source Business Models course. The TechChange Creative team had the pleasure of creating two flagship animations for the courses. Please click the hyperlinks below to enjoy the animations. The Fund has been specifically designed to finance early stage, open-source technology that has the potential to impact children on a global scale. The core motivation of the Innovation Fund is to invest in “clusters” or portfolios of initiatives around emerging technology, like UAVs, Blockchain, Data Science and AI or virtual reality – so that UNICEF can both shape markets and also learn about and guide these technologies to benefit children. Join our conversations and share the courses online. Follow the UNICEF Innovation Fund on Facebook here or on Twitter at @unicefinnovate. Storyboarding by the TechChange creative team in collaboration with the TechChange instructional design team. Illustrations by John Taesoo Kim.